We were so excited to bring The Rowcroft Sleep Walk back for 2019! Take a look at where our Sleep Walk events have taken place in previous years – and the massive amount they have raised for people living with life-limiting illnesses in South Devon – your friends, neighbours and loved ones! 2018’s Fun on the Farm, Sleep Walkers raised £101,705 for Rowcroft! Rowcroft’s Event Manager, Stewart Molyneux would like to say a huge thank you to all those who took part in The Rowcroft Sleep Walk as well as all those who supported the event by donating their time and expertise. 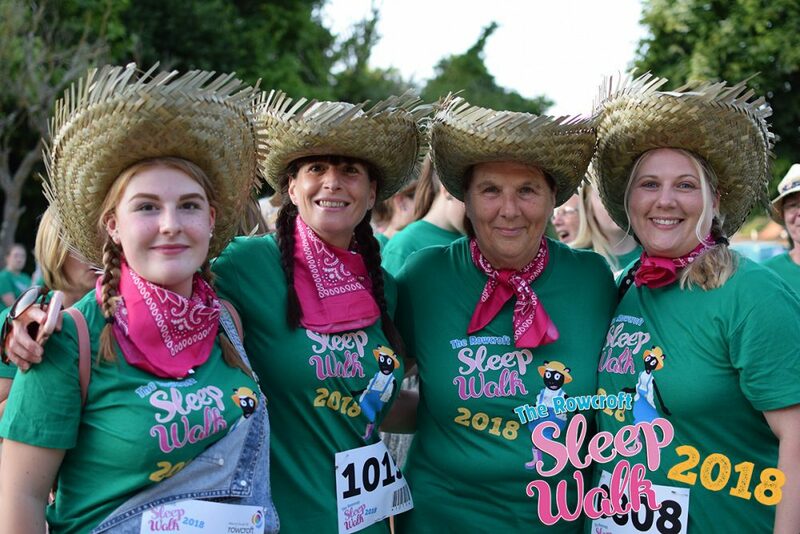 More than 1,400 ladies took part in the swashbuckling Rowcroft Sleep Walk 2017 raising £141,000 for local families. 2016 Sleep Walkers partied their way to a Sleep Walk fundraising record! Our fabulous 2016 Sleep Walkers donned leg warmers, shoulder pads and leggings for the 80s themed Sleep Walk party which raised an amazing £195,000 for Rowcroft taking the all-time Sleep Walk fundraising total to over £1,000,000! 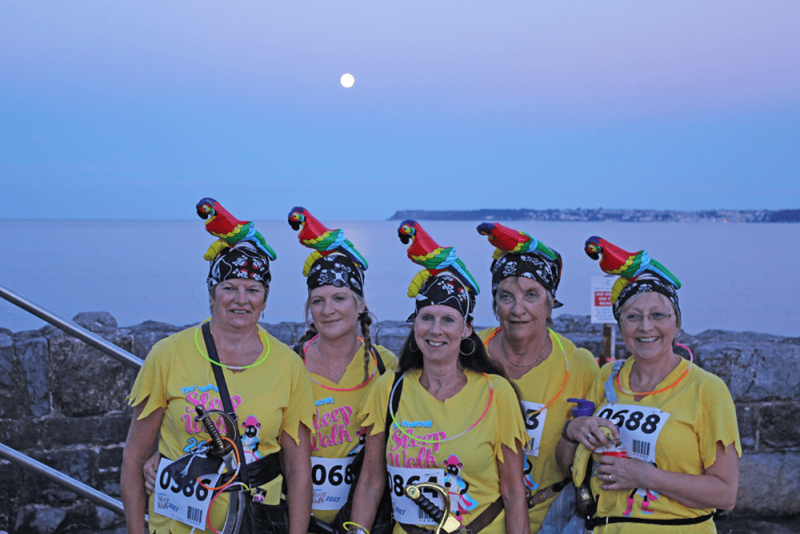 More than 2,000 ladies aged ten and over completed their choice of five or ten mile night walks on Saturday 11 July, raising an amazing £193,500 to help support people with life-limiting illnesses in South Devon, and their families, to make the most of every day they have together. 2014’s Sleep Walk created a Brazillian buzz on the streets of Torbay! A record number of ladies took to the streets to walk either five or ten miles on Saturday 26 July in aid of Rowcroft Hospice! Over 2000 carnival queens brightened the streets of Torbay in their Rio Carnival themed costumes and pledged to raise an amazing £167,000. But now that we’ve had all sponsorship in, we can finally announce that together an incredible £181,000 was raised this year! All of the money raised will go towards providing specialist care for people over the age of 18 living with life-limiting illnesses in South Devon. Over 1000 ladies raised sponsorship and walked on the evening of July 6 2013 raising a grand total of £123,000 to help provide specialist care to those with life-limiting illnesses. 2012 saw a record number of walkers for any Rowcroft nightwalk…2000! Brand new venues and a really lovely route proved more popular than ever and walkers signed up in their hundreds to support Barbara The Sheep and Rowcroft Hospice. Over £200,000 was raised and over 200 volunteers supported this epic night and it ran very smoothly, with a great disco theme! A huge well done and thank you to all those involved, here’s to another brilliant year! 2011 saw the first ever Sleep Walk and what a huge success it was! 1800 ladies signed up in just six weeks to join Barbara The Sheep on this fantastic new night walk. Over 300 on the waiting list, who were all desperate to join in! Top national drinks brand Shloer were event sponsors; making sure the Sleep Walk was a sparkling affair! Two unique venues made it a truly special night; the beautiful Occombe Farm and the atmospheric Kents Cavern. A choice of five or ten mile routes ensured everyone could achieve their goal. Over 1000 Barbara The Sheep ears were sold and donned on the night! Over £2000 was raised in Sleep Walk merchandise alone. Over 3000 cups of tea/ coffee were served on the night, supplemented by sweets, treats and of course, all important butties at the end! 55 porta-loos were placed along the route!